Each building has its way of dissipating the heat. A start-up from EPFL and CSEM is putting on the market a thermal regulator that uses neural networks to learn about your house as the seasons change, allowing for savings of up to 65% on fuel. Winter is still with us, and an efficient central heating system is essential. However, most of the existing installations only react to one single parameter  the outside temperature  in regulating their output. Researchers at EPFL have developed a system that manages multiple parameters and learns what is best for your house by imitating the most complex computer in the world  your brain. The technology has spun off into a new start-up called Neurobat (for Neuron and Batiment, the word for building in French). Each building reacts differently to changes in temperature. If you put 20 people together in a room, it soon becomes stifling. Let a fierce winter sun come in through wide bay windows and fill your living room, and the temperature jumps several degrees while the radiators continue full blast. If we can manage to better take into account the properties of each building in terms of the habits of its users and its position with regard to the sun, its possible to make big energy savings, notes David Lindelöf, technical director of Neurobat SA. The company is a spin-off of work performed in the EPFLs Solar Energy and Building Physics Laboratory (LESO-PB), where David Lindelöf and his associate Antoine Guillemin, scientific director, obtained their PhDs. Created within the framework of a partnership between EPFL and CSEM (Swiss Center for Electronics and Microtechnology) in Neuchâtel, Neurobat is preparing to launch on the market a control module that uses several distinct sources to finely adjust the output of central heating installations. As well as the outside temperature, our device takes into account the level of sunlight  thanks to a solar sensor  and the way the dwelling itself reacts, using a thermometer placed in a dedicated room, explains David Lindelöf. Moreover, a presence sensor enables an automatic lowering of the heating output when there is no-one at home. 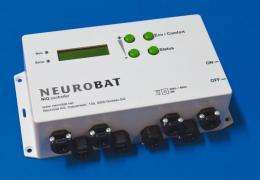 The Neurobat regulator has already been installed in several test buildings, among which are one at CSEM, and one in a private villa. Various tests have shown savings in fuel up to 65%, which suggests that savings of around 50% are envisageable in an average building. The relevance of this approach earned the company this years Swiss Environment Award, which was presented recently at the Swissbau trade fair in Basel. This gives a boost to the company, as it prepares to go on the market in the coming weeks.